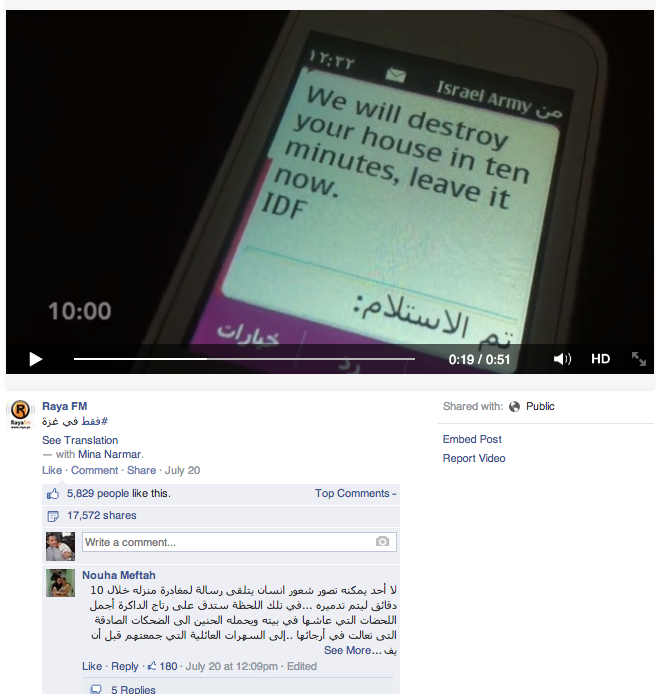 It purported to show a text message that the Israeli Army sent to residents of an area in Gaza, warning them of an imminent attack. Tom Trewinnard, who works for the non-profit Meedan, which is active in the Middle East, saw the image being shared by his contacts. The message was in English. 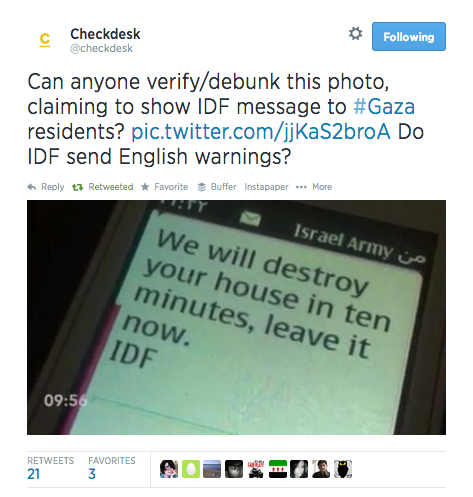 Would the IDF send an English message to residents of Gaza? 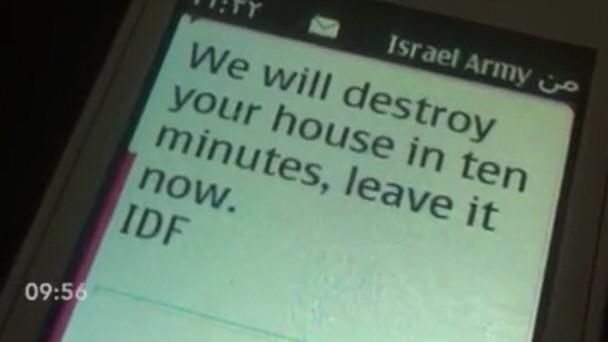 Language such as “We will destroy your house” seemed too stark, even though Trewinnard said he finds the IDF’s English Twitter account is often very blunt. 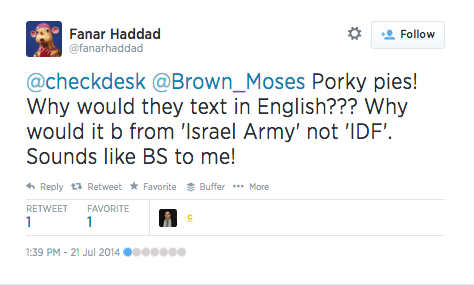 He wondered if someone in Gaza would have “Israel Army” saved as a contact in their phone. That is apparently the case with this person, as evidenced by the contact name in the upper right hand corner. The image has a timestamp of 9:56 in the bottom left hand corner. What’s that from? 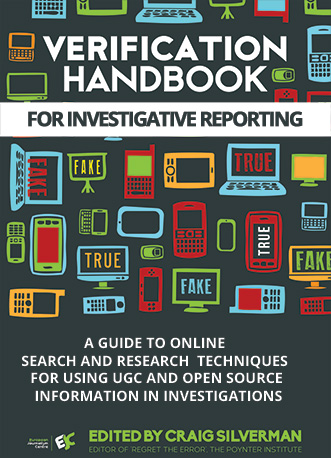 Trewinnard’s organization is developing Checkdesk, a platform that people and organizations can use to perform collaborative verification. He decided to open a Checkdesk thread to verify the image, and use it to track the verification process for the image in question. 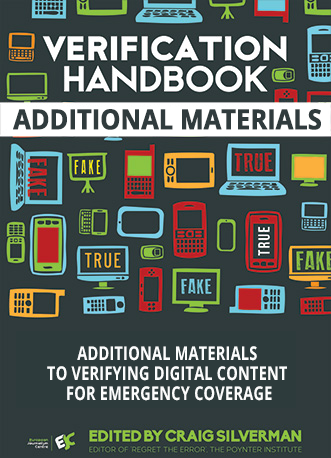 “The Checkdesk account has less than 300 followers,” Trewinnard said. He didn't expect an onslaught of replies. 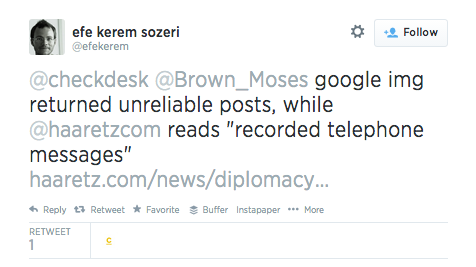 But a few retweets from people with a lot of followers, including @BrownMoses, inspired others to take action. The Checkdesk tweet included two specific questions for people to help answer, as well as an invitation for collaboration. Soon, Trewinnard was fielding replies from people who offered their opinion, and, in some cases, useful links. 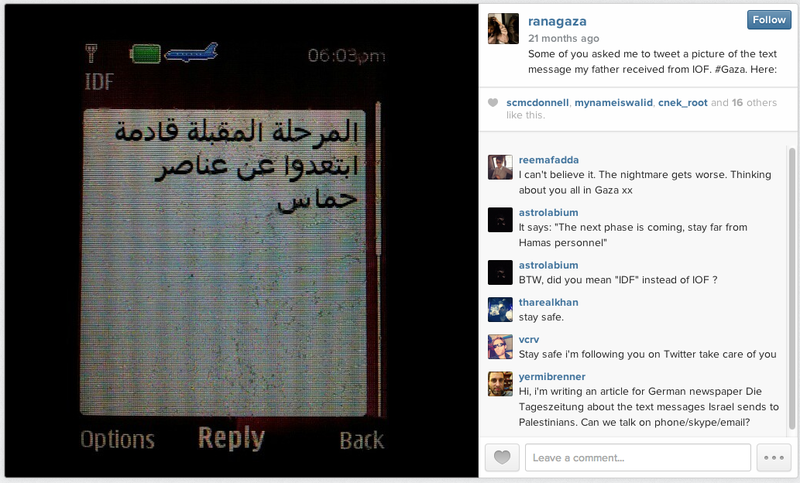 Trewinnard was able to verify that the Instagram user in question was in Gaza at the time, and that Israel was carrying out an operation in Gaza in that timeframe. 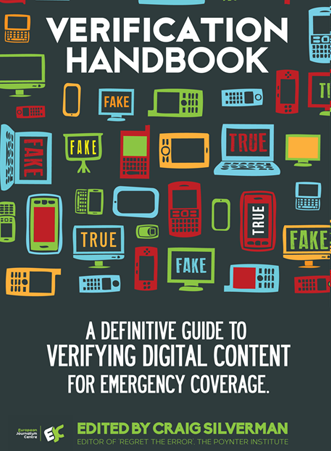 He also saw that the same image had been used by the credible 972mag blog. 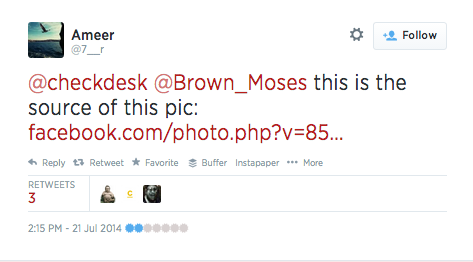 The above image provided a valuable bit of evidence to compare to the image he was working to verify. It differed in that the above message came in Arabic, and showed that the sender was identified by “IDF,” not “Israel Army.” Trewinnard also said the tone of the message, which warned people to stay away from “Hamas elements,” was different than the language used in the message they were trying to verify. This all suggested the image he was working on was not real. But there was still the question of where it came from, and why it had a time stamp in the bottom corner. “So there had been these flags … but this guy found the actual source of the image,” Trewinnard said. He said that the entire process took roughly an hour from his first tweet to the link to the video that confirmed the source of the image.